KoopaTV: Go ape with Donkey Kong Country! And Land! By LUDWIG VON KOOPA - EXPAND your horizons. If you are reading this article now, then it is too late for you to take advantage of the Nintendo eShop deal where you can buy an $8 Donkey Kong Country Virtual Console title and save $15 off Donkey Kong Country: Tropical Freeze (which had the best soundtrack of 2014). But hey, Nintendo notified you on your Wii U and/or Nintendo 3DS, though apparently system messages aren't enough to get your point across. ...Why is this article-worthy? Well, because the Donkey Kong Country SNES games had a bit of a... unique situation while on the Wii. "If you like your Donkey Kong Country, you can keep your Donkey Kong Country." - Barack Hussein Obama. I know this from experience, since my exposure to Donkey Kong Country 3 came from my horrible Let's Play of it, courtesy of the Wii's Virtual Console. Meanwhile, my experience with Donkey Kong Country 1 came from the horrible Game Boy Color port, which I talked about before. 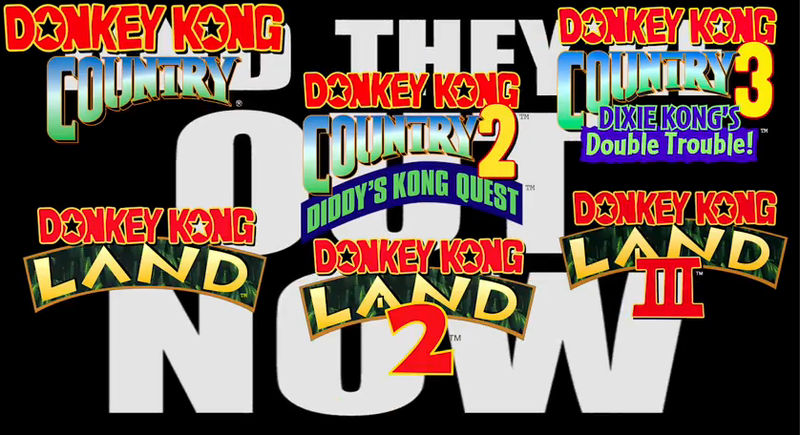 So that leaves my only positive experience with the series, before Donkey Kong Country Returns (actually, I LIKED Donkey Kong Jungle Beat but a certain fellow staff member at KoopaTV insists it doesn't count), with the Game Boy Advance remake of Donkey Kong Country 2. And, wow, that was a fantastic game. I had a poster from Nintendo of America of the box art for that game in my room for about a decade, so I got to look at Dixie Kong every night when I went to bed. Wonderful. Why do we go from Donkey Kong Land 2 (Arabic numerals) to Donkey Kong Land III (Roman numerals)? RawkHawk2010 believes that these games will not last six months (September) on the Nintendo eShop and they will be taken down again. I believe they will last longer than that. This article really exists to publish, to the world, this "bet". If Rawk is wrong, then... I'll laugh at him. (Which I guess isn't anything new.) Actually, we've agreed that the loser has to go dance in the streets with ethnic minorities. Anyway, if he's right, then maybe his Donkey Kong fan victim complex has some validity. ...I mean, the franchise's sub-par representation in Super Smash Bros. 4 is definitely true. The series has a lot more music choices than just the jungle themes, Sakurai. ...And only two characters? Hm. Oh, and there's also "#ChunkyGate", an alleged scandal where Chunky Kong apparently was in Super Smash Bros. 4 but was cut and then all mentions of him were erased, including from the DK Rap. Compare the DK Rap from Super Smash Bros. Melee to the song's "port" in Super Smash Bros. For Wii U! Have them play at the same time, actually. The videos are of the same length but... not the same content! Oh, and apparently Mario vs. Donkey Kong: Tipping Stars, that game that no one even knew existed, is coming out March 5. If you think KoopaTV is going to cover it, you better look at another website. Or you can Request it and then get points in our KoopaTV Loyalty Rewards Program. We PROBABLY won't honour it, but that doesn't matter. You probably didn't even know or care that the game existed. Seriously: Donkey Kong Country 2, Donkey Kong Country Returns (3D), and Donkey Kong Country: Tropical Freeze are all top-notch side-scrolling games. Get 'em all, I say. According to some, they won't be available for much longer! Ludwig is not KoopaTV's resident Donkey Kong fan, but he's a huge fanboy of Dixie Kong. You should be, too. Give your thoughts on Dixie Kong and the rest of the Kong family and their games in the comments! Over three years later, the Donkey Kong Country games are still on the eShop, but their tropical friend is not. I got Donkey Kong Country Returns 3D from Club Nintendo and started it the other day to take a break from Fantasy Life. Wot do you think about our bet? So far I like it as much I like any 2D platformer, more than some. I think you'll win the bet, but then, I have no idea why the games were taken down the first time. DKC2, DKCR, and DKC:TF are in my top-tier of platformers along with Yoshi's Island. VERY WELL-MADE. We don't know why, either. Out of all Kongs, I only like Tiny Kong. She was pretty good at baseball in Super Mario Sluggers. Talking about Kongs.... Let's all take a moment of silence for Lord Harambe.